Poldark Mine is a fascinating early 18th century tin mine and certainly one of Cornwall's most important heritage sites. 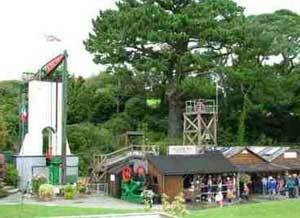 Located in the picturesque Wendron Valley the attraction, which offers free admission, has something for all the family. With fascinating heritage displays, guided underground tours, and wonderful craft workshops from woodturning to candle making, Poldark Mine is a great all weather family day out. The attraction also offers an array of other activities for all the family including panning for real alluvial gold, searching for precious gemstones in the gemsands and face painting. There is also a wonderful children's playarea and award winning gardens as well as a restaurant, caf� and gift shop.